Meet my largest marked boy Paintedcats Meteorite up of Cazpurr. Meterorite has Patches of large rosettes all over him. Meteorite's mother is Cazpurr Covergirl. Two stunning cats indeed. Meterorite and Covergirl was a program that I had started way back in 2006 moving forward each year. Starting with with Double take Meg of Cazpurr. 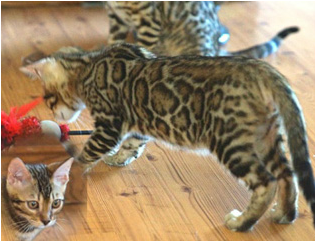 His grand mother Leopardrealm Grafitti of Cazpurr was used in my breeding program until she was almost 6 years. I now have her daughter Cazpurr Arizona. Still moving forward with this line of cats I look forward to my new off spring from Cazpurr Arizona. Meteorite's parents were both tested for HCM and PK deficiency and were cleared of any heart problems or kidney problems along with his grandparents. 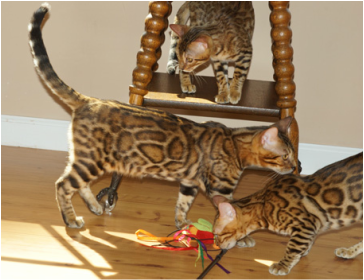 It is nice to be able to go back a few generations on the HCM and PK testing it gives you a good peace of mind when purchasing a pet or breeder kitten. Meterite was also tested for HCM in November of 2015 as Negative a perfect history. Cazpurr Cover girl. Her sire is GRC Gogees Black Beard of Cazpurr who I had a lot of fun showing at the cat shows which gave him his title of GRC. I started using Blackbeard in 2009 until 2014. Black Beard going on 7 years old and is still currently HCM Negative. Blackbeard shown below. AIt is nice to go back a few generations on cats especially for the HCM and PK testing. It gives you a good peace of mind knowing that your kitten has a real good chance of being very healthy from the get go.